Insulin Resistance (IR) is a physiological condition in which pancreatic cells fail to respond to normal actions of insulin hormone. It is a milestone for the development of diabetes and its complications. The current approach for the treatment of the diabetes and insulin resistance includes pharmacotherapeutics. However, this therapy includes the development of drug tolerance, potential toxicity and inadequate relief warranting the investigation of newer approaches for treatment. A potentially safe and effective therapeutic treatment for insulin resistance (IR) in diabetes is required. The current research is focused on herbal or phytochemical drugs. The potential herbal targets with insulin mimetic, secretagogues and promising activity are under the scope of this review. 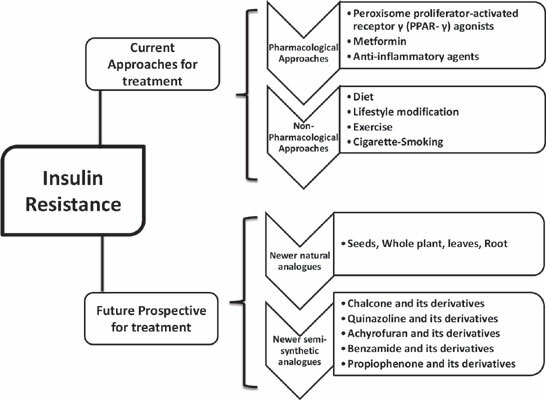 In this review, we have discussed the herbal targets and non-pharmacological approaches for the treatment of IR in diabetes. This review aims to compile the relevant information regarding various phases of drug development for the management of the insulin resistance and highlight the future prospective for its treatment by natural and semi-synthetic drugs. Diabetes, insulin resistance, semi-synthetic drugs, treatment, pharmacotherapeutics, natural drugs.